Recruited from University in 1888, originally from the Castlemaine Football Club. Sutton named in Carlton squad of 21, of whom 20 to play in the victory against Williamstown at the M.C.G. The following week August 25 named in the squad of 22 to play Essendon at the East Melbourne C.G. 1888 A junior in his first year, gave promise of becoming one of the most reliable back men in Victoria; a promise which he fulfilled later. 1890 Ted Sutton, one of Carlton's best. Edmund Hamilton Sutton went occasionally by the name 'Ned' and 'Ted'. Our Vice Captain in 1892, Sutton was later Melbourne's first captain in the VFL. 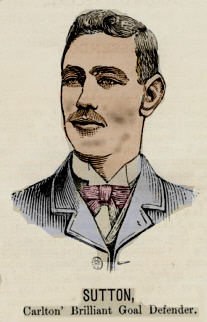 Sutton was named as one of Carlton's better player for year 1891. Appears in the 1891 Carlton Football Club team photo. 1894 An inglorious start was made by the Dark Blues in 1894, when they scored only three behinds to Footscray's 4.9 in the opening match. "What can be expected, other than defeat, when old and tried players like Ted Sutton desert their colours? One would have thought the misfortunes of the club should cause friends to rally round it, at whatever cost, and exert their powers to raise it to it's proper rank." Edmund 'Ned' Sutton was born March 24, 1868 and transferred to Melbourne in the VFA in 1895, he was also Melbourne's first captain in the League during 1897 and 1898 and played in 32 of Melbourne's first 34 League games. The two games he missed were both in 1898 in Rounds 10 and 16. "Old Victorians will recollect also his brother, Eddie Sutton (no longer alive), as a footballer playing for Carlton - as fine a full back as Victorian football ever saw." Page last modified on Sunday 01 of October, 2017 12:02:11 AEDT by blueycarlton. 1984 Rd 14 - Kourkoumelis with eyes fixed on the ball.